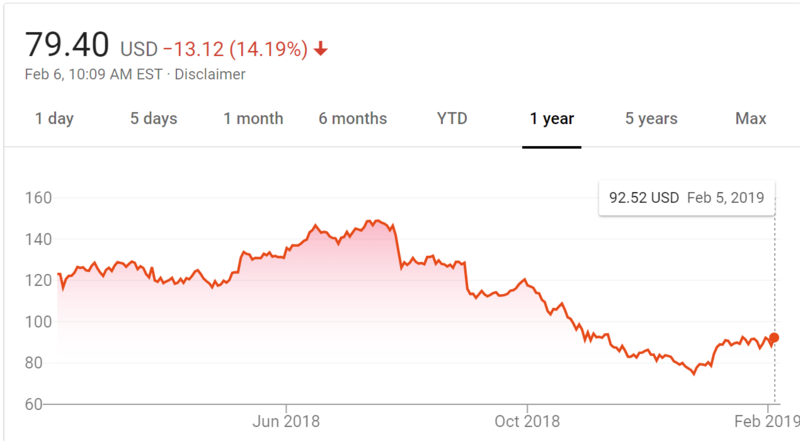 Electronic Arts closed on February 6, 2019 at the price of $80.21 USD following news that the publisher’s third quarter fiscal results did not perform to its expectations. The continued price drop threatens to wipe out the progress that EA had made in the first month of the year to begin recovery after its stock dropped to a low of $74.72 on December 24, 2018 following ten years of sustained growth that saw its stock peak at nearly $150 in July 2017 before steadily shedding much of that value over the following six months. Since last December the stock price has been slowly inching its way back up, breaking $90 by January 10 and holding steadily for the past month. With the announcement that EA would miss its estimated revenue by approximately $140 million, at $1.61 billion for the quarter versus $1.75 billion, shares immediately dropped from $92.52 on February 5 to $79.26 on February 6. EA CEO Andrew Wilson stated acknowledged that EA did not perform as he hoped, owing partially to the underperformance of Battlefield V.